Do you remember the Falabella Palace? It houses the Providencia district's Town Hall and until january 28th you can see an antiques and used books fair. This table called my attention. 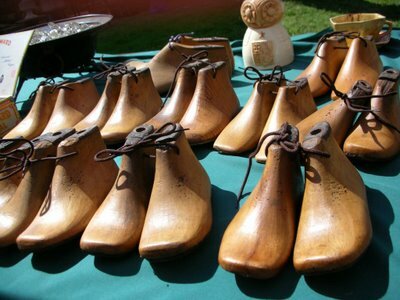 You can see many wooden shoe molds, of the size of children feet! They were tied together and looked odd. Very interesting shot. Shoe molds are very collectible here in the states. I wonder how old these are. Interesting. Were they for sale?